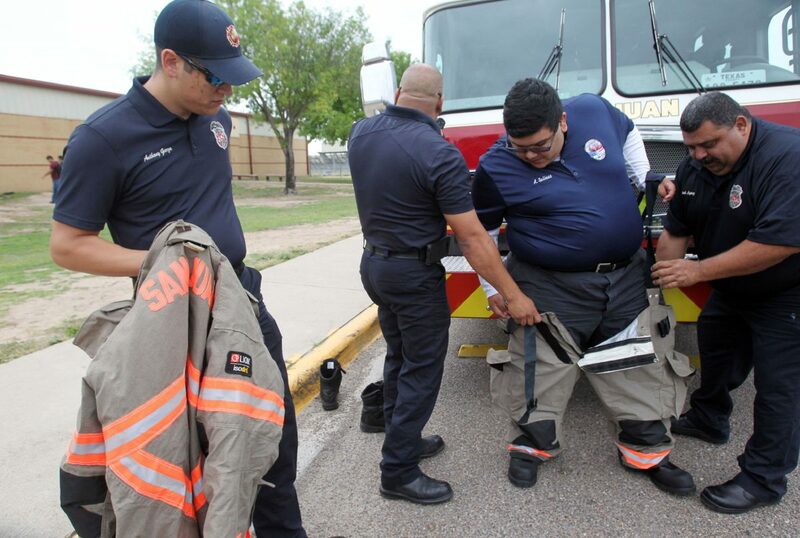 San Juan firefighters Anthony Garza, Oscar Lopez and Rick Lopez help Anthony Salinas, 18, get into a firefighters suit before his "promposal" to HayLee Alvarado at PSJA Early College High School on Friday, April 27, 2018, in San Juan. SAN JUAN — Horns blaring, lights flashing and dressed in full gear, Anthony Salinas stepped off of a firetruck to ask his now-official date to prom— raising the bar for promposals everywhere. The PSJA High Early College senior invited his childhood friend Haylee Alvarado, also a senior. Both students have autism and are enrolled in a law enforcement course at school, which is why Salinas decided there would be no other way to ask than to have the fire department involved. “We’re such good friends,” Anthony said. 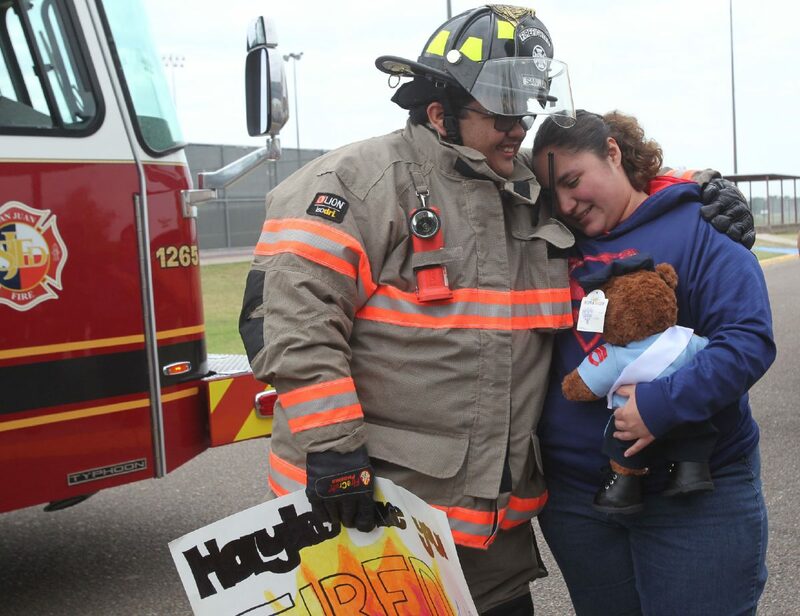 At the bus pickup location on campus, surrounded by firefighters, students, a few teachers and their mothers capturing the special moment, Haylee accepted the invitation. HayLee Alvarado, 18, says "yes" and runs to hug Anthony Salinas, 18, during a "promposal" at PSJA Early College High School on Friday, April 27, 2018, in San Juan. Salinas dressed up as s firefighter with the help of the San Juan Fire Department. 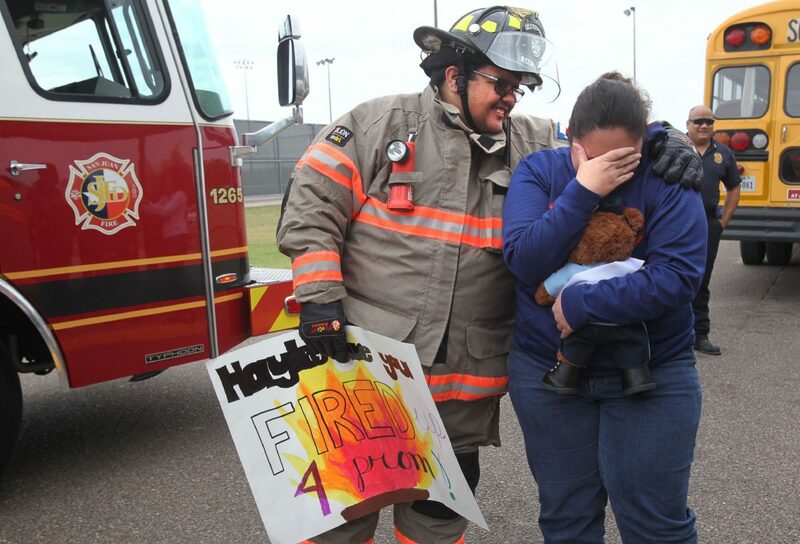 HayLee Alvarado, 18 gets emotional as Anthony Salinas, 18, a senior at PSJA Early College High School asks her to prom during a promposal beside a San Juan firetruck Friday, April 27, 2018, in San Juan. HayLee Alvarado, 18, reacts as Anthony Salinas, 18, (not seen) asks her to the prom at PSJA Early College High school Friday, April 27, 2018, in San Juan. 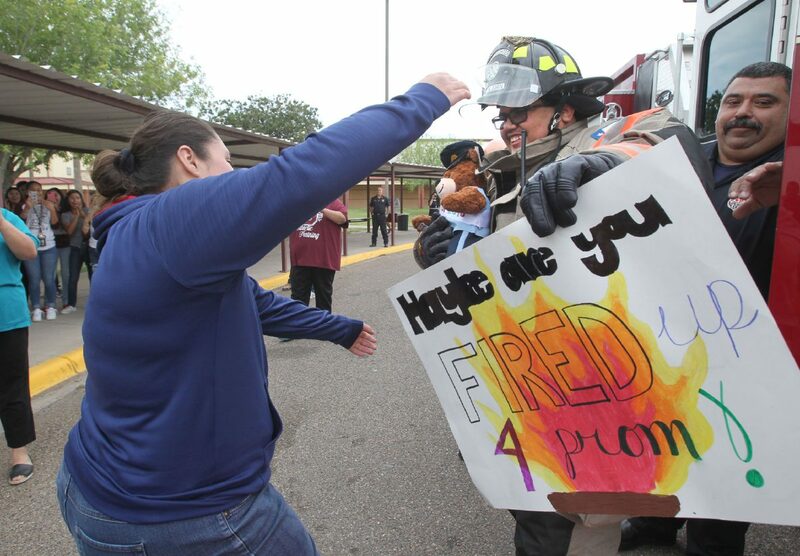 Anthony Salinas dressed up as s firefighter with the San Juan Fire Department for the "promposal." 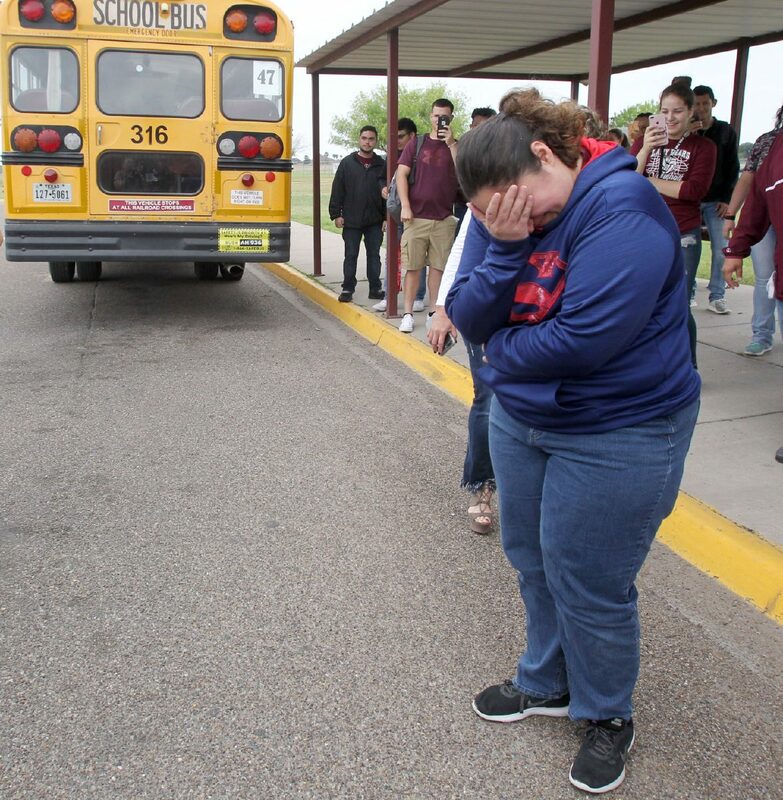 HayLee Alvarado,18 gets emotional with Anthony Salinas, 18, during a "promposal" at PSJA Early College High School on Friday, April 27, 2018, in San Juan. Every aspect of the day lined up perfectly. Haylee even happened to be wearing one of her favorite outfits. “I’m glad I wore this shirt,” she said of her superhero printed top, clinging tightly to the plush bear Anthony also presented her with. Their law enforcement teacher, Daisy Garcia, helped plan the surprise with the help of both students’ parents, PSJA staff and of course, the fire department. “Nobody is going to outdo Anthony,” witnesses murmured. Garcia has taught Salinas for a number of years and said his “love and passion” for criminal justice is evident. Her courses train and encourage her students to develop real-world experiences through field trips and other exposure. On campus, Anthony serves as a security guard. To borrow the firetruck he called in a favor from his friends at the station who have made many visits to his home for his birthday parties. Haylee stays involved in school functions and activities by serving as mascot, demonstrating the spirit of the PSJA bears. Before their graduation, the pair will attend their “Arabian Night” prom May 5.